Security notice: Information is stored in key files. If someone copy the database and key files to another server he could get access by using same login name. To avoid this specify @passwd parameter. Attention: if you test this feature with SQL Management Studio (SSMS), you need to restart SSMS after any change to see the result. SSMS caches connections even if you press "Disconnect". The function does not replace existing SQL Server authentication mechanism. It only grants access to the database for given login and password that passed existing SQL Server authentication. @login - any login name. Not verified and may be actually created later. It may be SQL login, Windows login or Windows Group. If @login is a Windows Group, SQL principal with this name must already exist. @passwd - if @passwd is specified then current login's password as verified with that password. Access is denied if passwords are different. If no password specified, then access granted only by login name. Passwords can only be compared for SQL login. @save - make permanent changes. Default set to 1 (yes). If set to 0, changes are not saved. It remains active until next change or SQL Server server restart. 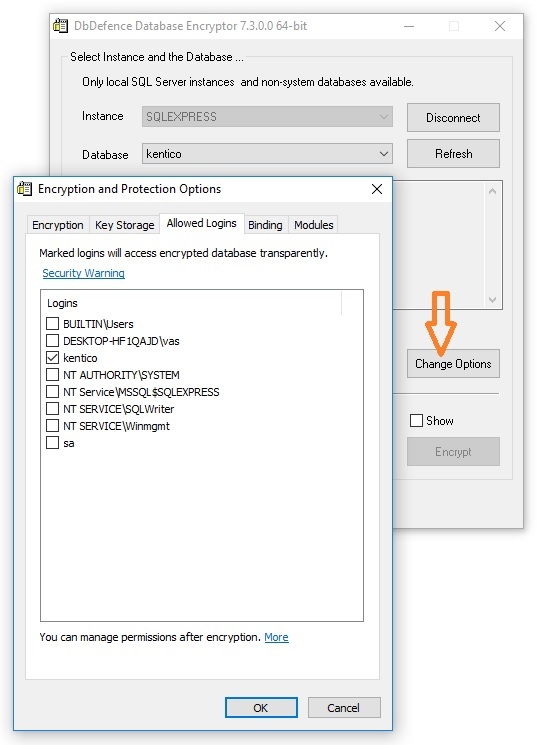 You can do the same with the GUI before encrypting the database. However the GUI does not set password dependency. Such automatic logins get full access to the database data, but can't change DbDefence settings for the database: backup mode or call dbd_add_login, dbd_add_ex. Note: to create objects in existing encrypted database you need to unlock it first.